I must start off with a big thanks to AnimeWorks for releasing my favorite anime to the United States (and Canada). It was a really great feeling to pop in a Rurouni Kenshin tape and see an FBI warning instead of a fansub introduction. 140 years ago in Kyoto, Japan, there was an imperialist named "Hitokiri Battousai (or Battousai the Manslayer, etc.)" In the chaos of the Tokugawa regime he killed and carved the way to the Meji era and was known as the strongest. As the war ended, he disappeared without a trace and became a legend. Handsome indeed! Ahem, ten years after his disappearance the Battousai has come back, and he is slaying people in the name of Kamiya Kasshin Ryu, Kaoru's school of swordsmanship. She coincidentally runs into a wanderer who saves her when the so called 'Battousai'(who turns out to be an expelled student from her school) attacks her, and we find out who the REAL Battousai is. Kaoru's students abandon her school after the fake Battousai taints its name. While Kenshin (yep, thats the former wanderer guy) and her are out one day, they are pickpocketed Yahiko, a kid who has been forced by a local syndicate to pay back the medical bills his late mother owed. Kaoru and Kenshin save him and so a new student joins the Kamiya Kasshin Ryu. Word is out on the street that the Battousai has reappeared. Police officers bust in to Kaoru's Dojo looking for him. Fortunately, Kenshin is in town buying tofu. 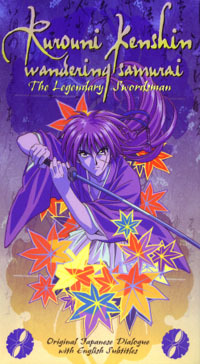 When innocent people however are attacked by corrupt police, Kenshin steps in with his cool theme music and shows everyone that he is there to protect the innocent and to preserve peace and justice with his Sakabatou (reversed-blade sword). While eating out Kenshin & co witness drunks arguing over politics. When the waitress is attacked a tall, handsome, strong, beautiful hair...ahem, Sanosuke, fighter for hire, steps in and is anxious to fight. Having known Sano's reputation, Gohei (the fake Battousai from the first episode) hires him to kill Kenshin after his humiliation from the first episode. After hearing that Kenshin was the "Hitokiri Battousai" Sano finally has a worthy match (what he did to those drunks was awesome!). And it doesn't end there AnimeWorks has already released four volumes of the series (up to episode 16), subtitled and dubbed on VHS. DVDs of the first volume were released, corrected because of errors, and replacements for those who experienced problems with their DVD will be sent early this month, as well as the DVD for volume 4, False Prophet. I know what I am putting on my Christmas list. Overall I think AnimeWorks did a decent job. The translating for the opening theme, Sobakasu was kind of odd but it gets the point across. And the ending theme, Tactics, was simmered down quite a bit. It was less explicit than my understanding of the lyrics. One thing that does make my hair stand on end thoush is the translation of Kenshin's "de gozaru". It is a phrase used by samurai that is tagged to the end of every sentence to be respectable. The subitling makes my favorite red-haired-cross-shaped-scarred man sound like Yoda! Don't get me wrong, Yoda is awesome, but Kenshin was not meant to be his rip off. You get used to it though, eventually the eye grows numb to the pain. Everything else for the most part is accurate. But to me it doesn't really matter, I am just thrilled knowing that I can actually purchase episodes at the mall. I really love this series. The storyline is unique, complex, and realistic, and the animation is absolutely gorgeous. The men are drawn so well!! I drool whenever I see that fight scene in the opening theme. I encourage everyone who hasn't already, to give Rurouni Kenshin a try.